The Massachusetts Bay Transportation Authority’s Red Line runs from Alewife in North Cambridge to JFK/UMass in Dorchester, where it splits. Some trains run down to Ashmont, which is the termini of the Mattapan High Speed Line (a trolley line like the Green Line and run by the same operations team, but colored like the Red Line on maps and retaining the old MTA orange livery) while others continue along the coast through four stops in Quincy and the terminus at Braintree. I’ve only ridden the Ashmont fork once. 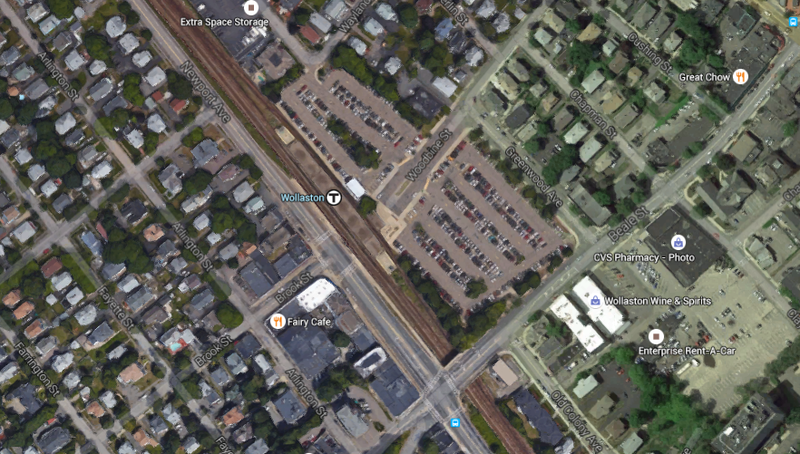 It was the winter and it seemed like I was traveling through those Lost Boston or Dirty Old Boston photos that get periodically shared on Facebook and published in coffee table books, so this post will focus on the Braintree branch. Originally, the Red Line went from Harvard Sq to Ashmont, but it was extended to Braintree in the 1970s and to Alewife in the 1980s. It was supposed to go through Arlington to Lexington, but NIMBYs in Arlington blocked it. Anyways, I’ve gone down to Braintree a few times and come up with a few observations. 1) While I do use the shopping center in Braintree Center because the Kmart down there is the only place I can get pants that fit without spending $100 or more, it is somewhat confusing. For one thing, you finally find your way out of the parking lot and enter, get this, another parking lot! For another, I know for a fact that people live and go to school in Braintree, but judging by what I can see on the train, they must have lived in the parking garage or the shopping center. As far as I can see, there are no houses or schools. 2) The portion of the journey between JFK/UMass and North Quincy is very slow and very long. I wouldn’t be surprised if it was the longest stretch between two stations in the entire system. 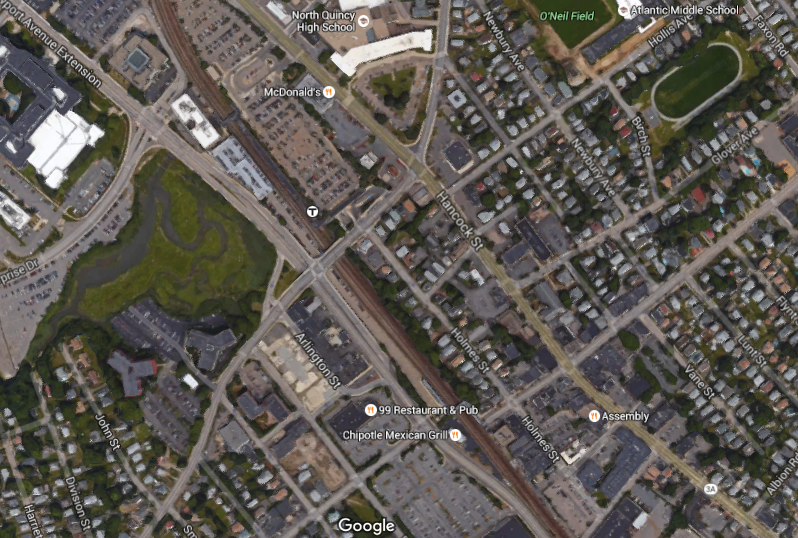 There should be a station in Port Norfolk/Neponset, a neighborhood of Boston that seems underserved by transit. 3) WHAT IN THE WORLD IS GOING ON IN QUINCY? Four Red Line stops, all surrounded by acres of parking and/or parking garages. 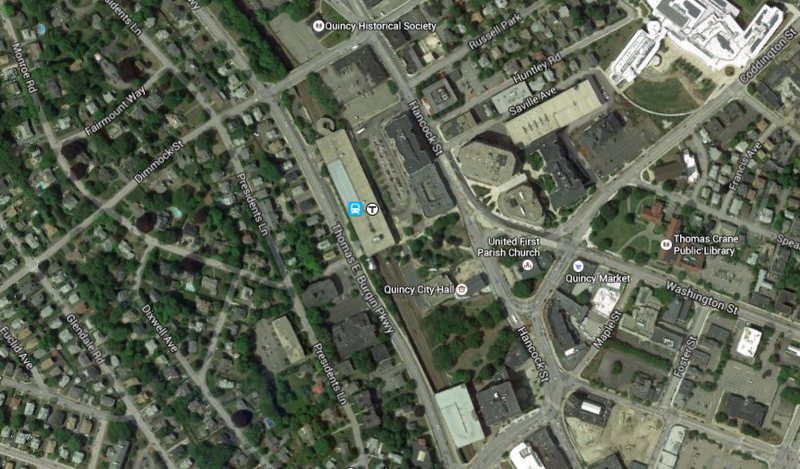 There are a few tall apartment buildings within a five minute walk of North Quincy, but they’re both surrounded by surface parking and they have garage parking. For everything else it’s detached single or two family homes, one story commercial buildings and acres of surface parking. That’s North Quincy. Parking, stroad, parking and more parking. Things are different in Wollaston. There are two stroads! Quincy Center shakes things up with a big parking garage and a big park. The really sad thing about this photo is that the sort of downtown Quincy, is about a mile south of the station. Of course, it’s just the one street surrounded by even more surface parking and parking garages and stroads — I’m noticing a theme here. Finally, the worst of the lot: Quincy Adams. It’s in a parking garage. Off a highway. Why was a station built here at all? Why is there no walkable connection between the station and the residential area? 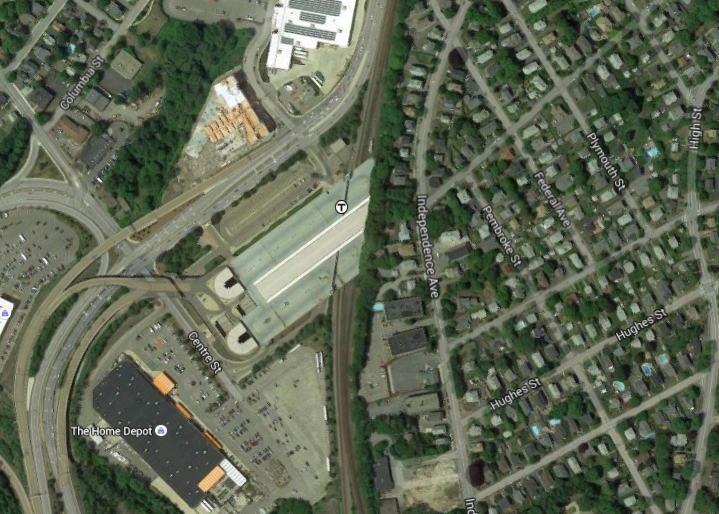 Why is there negligable urban development around these stations? According to the 2014 MBTA Blue Book, a typical weekday sees 30,161 entries for the Braintree branch to 19,442 for the Ashmont Branch. This seems good until you realize that the Ashmont branch is short and the stations are bunched together. It gets worse when you look at the historical statistics and find out that entries on the Braintree branch stations have been declining or stagnating in ridership since 1990 while Ashmont stations have seen a stagnating or increasing number of weekday entries. The confusing thing is that it’s not like Quincy is anti-development, they just don’t use their great subway stations for some reason.